Snoring and sleep apnea limit the amount of oxygen to the brain leaving an overage of carbon dioxide which may be linked to anxiety. When the brain is lacking oxygen, certain areas of the brain become impacted by the oxygen shortage and can trigger anxiety, fear, panic attacks, and depression. This is a serious issue and a lack of oxygen to the brain occurs when a person has sleep apnea. Is there a link between snoring, sleep apnea, and anxiety? Let’s take a closer look at the evidence behind this. High carbon dioxide levels in the body can increase acidity in the body – specifically in the amygdala. 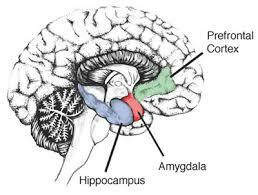 The amygdala is a piece of gray matter located in the cerebral hemisphere of the brain. 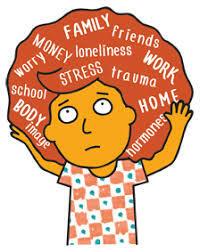 Its main function is to control emotions that include motivation, fear, and stress. So what does sleep apnea have to do with the amygdala? First, you must understand what happens during sleep apnea and how oxygen becomes limited to the brain. Some people use sleep aids in order to fall asleep at night. These can include alcohol, prescription drugs, or narcotics. All of these sleep aids may cause you to over-relax, especially if you sleep on your back, and may promote the relaxation of your tongue. When the tongue relaxes, it rests towards the back of your mouth and actually blocks your airway, prohibiting the flow of oxygen to your body and the brain. Other airway blockages can occur that do not relate to the tongue. These include excessive phlegm located in the back of the throat or mouth, congestion in the nose, and excessive fat deposits in the neck due to being overweight or obese. Whatever reason for the blockage, in one form or the other, it obstructs the flow of oxygen while you sleep. Loud, obnoxious snoring is one of the main indicators that you suffer from sleep apnea. Snoring is directly related to the obstruction of your airway. When the blockage of air occurs, again for whatever reason above, it narrows the airway passage that carries oxygen into the lungs and the rest of the body. Although the passageway is narrow, oxygen is still able to get in, and it finds a way to bypass the obstruction and continue to flow. The back of the mouth and throat is lined with tiny flabby tissues and when the air flows passed these flabby tissues trying to make its way into the lungs, the tissues start to gently vibrate as you inhale. The vibrating tissues create a noise as the oxygen flows by and this is the resulting sound of snoring. The blockage in your airway limits the amount of oxygen flowing into your lungs and causes you to stop breathing for several seconds. This is commonly witnessed by your partner sleeping next to you. Since the snoring is usually loud and burdensome, it’s easy for the bed partner to notice the loud snoring and then abruptly hear complete silence. This moment is when your body has stopped breathing. The flow of oxygen to the brain has completely stopped. It can be very scary for the bed partner to hear or witness this. It’s very dangerous and sleep apnea is a serious sleep disorder that needs to be addressed with your doctor. When the flow of oxygen stops, the brain quickly realizes that it has an abundance of carbon dioxide present. This increases brain acidity and it activates proteins and the amygdala that cause fear and anxiety. The brain activates the nervous system at this point and signals to the respiratory system that it needs to breathe again immediately. Once the lungs start to function again, you inhale a deep breath of oxygen and usually awake and sit up frantically gasping for air because your brain signals to you that you were oxygen deprived. The feeling of fear is also triggered in this moment due to the high acidity levels now present in the brain. It may take a second or two for you to realize that you couldn’t breathe and then you lay back down. In some cases though, the person with the sleep apnea takes a loud gasping breath but does not wake up and just continues to sleep and snore again. When you have sleep apnea, you unknowingly awaken, breathe, forget you woke up to breathe, and then go right back at it again. This is the most dangerous part of having sleep apnea because if you do not have a bed partner to witness this, you may never know that you snore or stop breathing. Some people who suffer from sleep apnea can stop breathing anywhere from 4-55 times a night, based on the severity of the sleep disorder. The first step in preventing snoring and sleep apnea is to consult with your doctor on the matter. Your physician will refer you to a sleep clinic and you will most likely undergo an overnight or at-home sleep study in order to determine the presence of sleep apnea. If you do have sleep apnea, there are a series of treatment options available that include CPAP therapy, the use of oral appliances, surgery, or other holistic treatments. As mentioned above, the lack of oxygen passing to the brain can trigger brain matter and proteins to produce unnecessary acids which then impact the amygdala, where fear emotions are managed. 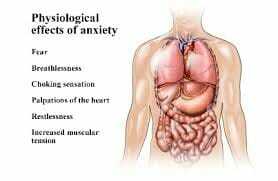 This can lead to anxiety during your night’s sleep but also may progress to short term or long term anxiety issues. If you are able to have the sleep apnea diagnosed and then treated, the anxiety should disappear, however, may still linger with some patients. Here is a list of recognizable signs of anxiety below. When you do not get a deep night’s sleep due to being woken up in the middle of the night from sleep apnea, the nervous system is not fully rested and can create anxious thoughts and feelings that leave you stressed, irritable, or nervous. Make sure you schedule an appointment with your doctor in order to address any concerns related to sleep apnea, snoring, and anxiety. Previous post: Sleep Apnea and Headaches – Why Do I Constantly Have a Headache In The Morning?